One of the most common forms of arthritis –osteoarthritis is a spinal condition that affects almost millions of people around the world. This spinal condition occurs when the cartilage covering the ends of the bones wear down with time and age. Also known as wear and tear arthritis, this condition can affect and damage any joint of the body. However, neck, lower back and knees are the most commonly affected areas of the body. This is why osteoarthritis can cause the patient severe back pain. 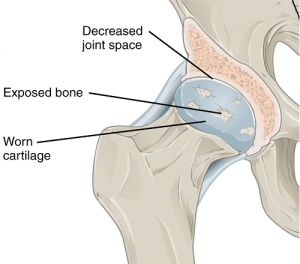 The affected joint area is surrounded by bits of bones that feel like hard lumps and are called bone spurs. Arthroplasty – joint replacement surgery where the damaged joint is removed and replaced with prostheses.